For thousands of years, botanicals have been recognized by many cultures for their restorative powers. 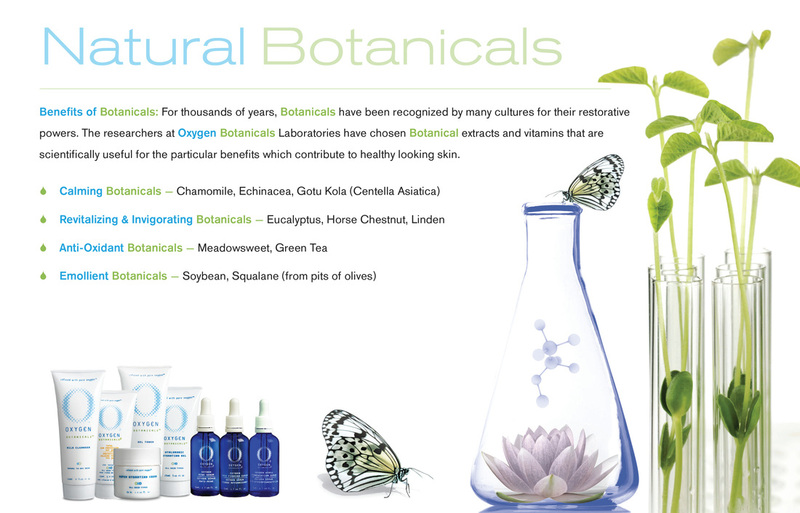 The researchers at Oxygen Botanicals™ Laboratories have drawn upon a wide variety of rejuvenating botanicals to enrich these oxygen-infused products. Each formulation contains botanical extracts and vitamins that are scientifically chosen for the particular benefits that they contribute to your skin’s health. Aromatic plants and oils have been used for thousands of years for their medical and culinary applications as well as in incense, perfumes and cosmetics. In ancient civilizations they were used in rituals where their religious and therapeutic roles were intertwined. Frankincense is still used during Roman Catholic Mass and sprigs of juniper are burned in Tibetan temples as a form of purification. In India, Vedic literature from 2000 BC lists over 700 substances used for spiritual purposes. The Chinese have an ancient herbal tradition that accompanies acupuncture. The Egyptians were perhaps the most known for their use of aromatic substances, using them for embalming and herbal ointments. The Phoenicians brought aromatic plants from the East to Greece and Rome. Hippocrates, known as the ‘Father of Medicine’, prescribed perfumed fumigations and fomentations (warm, moist applications). A famous preparation called Megalion was made from myrrh, cinnamon and cassis and was used for skin inflammation, battle wounds and as a perfume. The Romans extensively used oils as perfumes. With the fall of the Roman Empire, many physicians fled to Constantinople, taking the books of Greek physicians with them. The invention of the refrigerated coil for distillation around 1000 AD made it possible to produce pure essential oils and aromatic water. Rose water became one of the most popular scents brought to the West during the Crusades. The Europeans began experimenting with indigenous botanicals such as lavender, sage and rosemary. During the Renaissance period, aromatic materials were used as protection against epidemics. Perfumery and distillation industries grew into commercial enterprises, especially in France. A distinction was made between perfumeries and botanicals used in the apothecary. The scientific revolution brought the identification of the various constituents of the essential oils and gave them their specific names. This research laid the groundwork for the development of the oil’s counterparts and the growth of the modern drug industry. By the middle of the twentieth century the role of essential oils had been reduced almost entirely to use in perfumes, cosmetics and food. René Maurice Gattefosse, a French chemist, coined the term aromatherapy in 1928. He was fascinated by the therapeutic possibilities of the oils after accidentally discovering that lavender was able to heal a severe burn rapidly and help prevent scarring. He found many of the essential oils were more effective in their totality than their synthetic counterparts or than in their isolated active ingredients. Another French doctor and scientist, Dr. Jean Valnet used essential oils as part of a program to treat medical and psychiatric disorders. His research was published in 1964 in Aromatherapie. Marguerite Maury applied this research to her beauty therapies. She found that many perfumed essences, when correctly selected, represent many medical agents. Aromatherapy can be a misleading term because it implies the treatment is exclusively through smell. This is not the case. Each essential oil has an individual combination of constituents that interact with the body’s chemistry in a direct manner.